If you're tired of wearing pants but it's not a short dress kind of occasion, try a long khaki skirt. It'll add more warmth in the fall and winter than shorter options with tights, and it can keep you cooler than blue jeans might in the spring and summer. The long khaki skirt is a versatile option for any woman's wardrobe. Khaki skirts are often thought of as a fabric type, cotton twill, but in reality the term "khaki" refers to the color. What is khaki? To some, it's a dust color, a mix of brown and white. For others, there's more mustard yellow present with the light brown, giving the color more depth and warmth. Others also call a very light olive green khaki. No matter what color khaki is to you, it is a neutral and easy to wear with almost anything. Khaki skirts can come in longer lengths from just below the knee to the ankle. Some are lighter in weight than others, while others are heavier, perfect for cool days, and feature cargo pockets and a drawstring. If your last memories of long khaki skirts involve teachers from the 1990s and early 2000s, you're probably not alone. These skirts can be new again, and because they're neutral, it's easy to mix and match them with things in your wardrobe to give them an updated look. Don't worry about looking like your high school algebra teacher or your college literature professor. All types of women can rock the khaki skirts in long lengths. 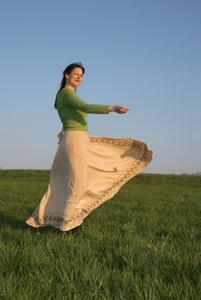 If you're wearing a full, long skirt, keep the shirt fitted. Skip white pastels that will nudge your outfit to the background of any event. Instead, perk it up with red-shirt, shoes, or bag. If you're not a fan of red, try other brights or jewel tones. Skip pairing a neutral top with a khaki skirt unless your accessories promise to be attention-grabbing. If you want a classic, but not boring, look, you can skip the bright colors and choose a striped shirt instead. Navy blue and white stripes will look much more exciting than either solid color when teamed up with the khaki skirt. If you're wearing a utilitarian style that doesn't flow much as you walk (or even if it does), give it a romantic spin by pairing a shirt with lace accents, or choose a shirt made completely of lace and put it on over a camisole in the color of your choice. Another contrasting option is chiffon. Pair a fitted denim shirt that shows off your curves with brown boots and a khaki skirt of nearly any length or style for a cowboy-inspired look. Roll up the sleeves on the shirt, leave a few buttons unbuttoned, and maybe even toss a belt around your waist to make the outfit more interesting. Wear a khaki pencil skirt that hits just below the knees with a turtleneck sweater and pumps for a retro vibe. Don't pair a bulky or boxy shirt or sweater with a long, straight khaki skirt. Khaki skirts in long lengths don't have to be boring at all. You just have to know how to balance them with fitted tops, romantic textures, and accessories that make you stand out. Depending on how you wear them, the length, the material, and the style, they can be perfect for work, a date, or a casual day off running errands.